At the end of the twentieth century Canadians came up with a house on Post and Beam technology. If you translate into Russian, it means "Pillars and beams". The original technology includes the best elements of the architectural achievements of the Germans, the French and Scandinavians. The technology of the Post and Beam home has been used in Europe for almost a hundred years. Canada has modernized the way, focusing on the cold climate of North America. This is what helped create houses that are more protected from heavy snow and wind. This is a very important factor for the cold expanses of our homeland. Post and Beam frame and log houses have high strength characteristics and extraordinary forms of construction. You can create both classical and modern construction. The territory of Russia is characterized by a harsh climate, therefore the Canadian technology is popular in our latitudes. Construction passes quickly, and the construction of the log house extends the operation of the house for tens of years. 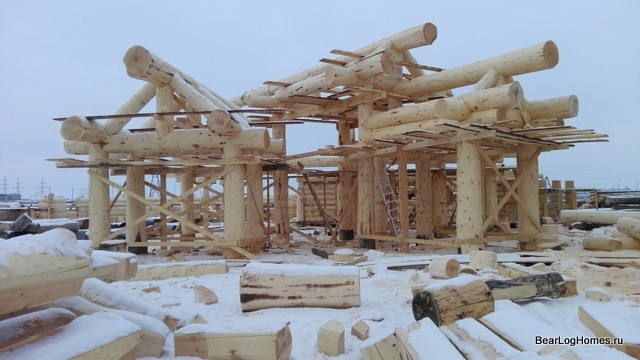 Visually, it's easy to see the main accent of the building: round logs on the frame of the house. Usually they are made with heat-insulation covering to preserve additional heat. the method of erection of the house leaves room for the modernization of the living space in the future. We use high-quality materials for girder and girder structures. Usually it is logs of cedar or larch. It is better to take cedar logs. Post and Beam technology is built on the basis of thick beams, which allow the use of increased thermal insulation of the structure. This method allows you to maximize the glazing of the house, which today is like many. After all, everyone likes to admire the beautiful views of nature, without leaving home. The decoration of the indoor unit opens a lot of space for the implementation of original design solutions. Excellent taste of the owner of the house will emphasize the unusual log house. The impressive experience of the company Bear Log - good houses made of cedar guarantee the pace of construction and the absence of flaws. To order construction, call + 7 902 9966727. We will tell all the details you are interested in. For more information about building houses, you can on another page. Houses Post and Beam.